A well articulated argument for more investments to boost ridership on the Metro bus system, which has fallen about 20 percent since 2013. The op-ed was written by USC professor James E. Moore II and Tom Rubin, who once served as the chief financial officer of the Southern California Rapid Transit District. Their primary argument here is that Metro is spending too much money on building new rail projects and that’s robbing money from the bus system. Their remedy is to still build rail — but at a slower pace — and shift money to the bus system while lowering fares. I think their overall argument is valid — that ridership will increase when the bus system is improved. That said, I think it’s worth mentioning that Los Angeles County voters in 2008 and 2016 voted to increase the sales tax to fund a number of rail projects. I personally believe those projects will serve the county well in the future as long as they are paired with a better bus network. Toward that end, Metro has launched a bus network restructuring effort with an eye toward making recommendations and implementing them in 2019 and 2020. More about that here. The study of the bus system will also look at improvements such as more bus lanes and traffic signal adjustments to get buses through intersections quicker. •Metro is adding all-door boarding to two busy rapid lines — the 720 and 754 — next year. •Measure M has funds for bus rapid transit projects in the next decade on the NoHo-to-Pasadena corridor, Vermont Avenue and an east-west line across the northern San Fernando Valley. The East San Fernando Valley Transit Corridor project will add either bus rapid transit or light rail from Van Nuys to the Sylmar-San Fernando Metrolink Station on Van Nuys Boulevard and San Fernando Road. •The Orange Line improvements project — also funded by Measure M — proposes to add crossing gates and a bridge to speed up travel times. As for the issue of lower fares, I would not get your hopes up. Large transit agencies such as Metro typically do not lower fares because operating costs over time usually rise. Extremely attentive Source readers will recall that a recent financial forecast to the Metro Board showed that Metro is now covering 80 percent of the cost of each ride. The same report mentioned “right sizing” fares at some point in the future. Point of emphasis: Nothing is currently on the table fare-wise. Quasi-related: Meanwhile, down in The OC, bus ridership increased 19.6 percent over the last year on routes where service was increased, reports Voice of OC. OCTA in 2016 reduced some bus service in the southern part of Orange County in order to add more buses to busier routes in the central and northern parts of the county. When the contract to build the Regional Connector was awarded by Metro in 2014, the projected opening date was 2020. That date has slipped to a deadline of Dec. 2021 because of issues with utility relocations. The gist of it: there’s a lot of stuff underground in DTLA, including old Department of Water and Power lines and other infrastructure, some of which was known about and some of which was news. 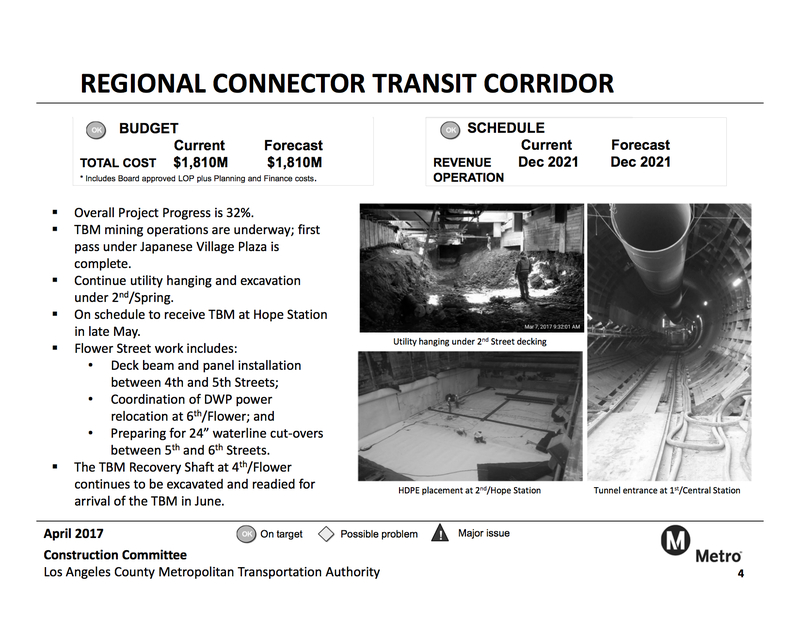 Metro has been reporting the 2021 date for most of this year, FWIW, both on the blog and in the publicly-posted and discussed reports given to the Metro Board’s Construction Committee. These are a good resource for those tracking projects (sampling from April 2017 below). But we could have done a better job being specific about it and the LAT story is accurate and fair. The LAT’s editorial page says a city of L.A. zoning plan that would allow 4,200 to 6,000 new residential units near five Expo Line stops doesn’t provide enough units. But the editorial doesn’t say how many should be added, meaning this is really just an exercise in re-stating the obvious: putting new residential near transit makes sense. The January 2017 construction project status report listed a “current” opening date of May 2017 (see file:///Users/andrew/Downloads/Program%20Management%20Chief%20Officer%E2%80%99s%20Report%20-%20January%202017%20(1).pdf). Then, the April 2017 construction project status report you posted above lists a “current” opening date of December 2017. Yet, I went back and listened to the April 2017 Construction Committee meeting and did not hear any discussion about this revised schedule, let alone an explanation for the delay. In fact, the April 2017 report lists the schedule as “OK”. The February 2017 and March 2017 reports do the same. Are you aware of any substantive discussion informing the board of this delay? Also, I don’t think it’s fair to characterize this as “Metro has been reporting the 2021 date for most of this year” as you do above. While technically true, I think it may be misleading given that based on these reports, Metro has encountered a material (7 month) delay in 2017. Hey that link you included doesn’t work. I’ve never seen anything saying it would open in December 2017. We have had many blog posts with photos and videos showing that it’s nowhere near opening. The January 2017 presentation to the Construction Committee is here: http://metro.legistar1.com/metro/attachments/c7e91ad8-54e4-42c4-a166-c259d262b35e.pdf. It clearly lists May 2021 for revenue operation for the Regional Connector. As I wrote, we should have put together a post earlier this year saying why we’re now saying 2021 instead of 2020 and made clear the difference between the early 2021 and opening 2021. That’s on me. That said, we have said “2021” in many blog posts and I don’t think the fact the date has gone from 2020 to 2021 is new news, although it’s certainly fair news to report. Sorry that was a typo on my part–I meant May 2021. My point is the January 2017 report listed May 2021 as the opening date (though previous reports had listed July 2021 as the “forecasted date”) and then all of a sudden in April 2017 we hear that the May 2021 (or July 2021) date has been pushed to December 2021. That’s a 7 (or 5) month delay that I would consider material. Yet in each of the presentations between January 2017 and April 2017, other than changing the date, there was no hint of any struggles. And I didn’t hear any discussion of the 7 (or 5) month delay in any of the Construction Committee meetings from January 2017 through April 2017, which is when this delay presumably manifested. Fair points. I think the PR lesson learned is get out in front of these type of stories, right? Thanks Steve H for commenting on the Times article about the Connector. As for the editorial concerning Expo-adjacent development, the 5 West LA stops offer challenges. Culver City and Palms are probably would probably be easier to go more dense as those neighborhoods already have predominantly multi-family housing. There’s a snowball’s chance that Rancho Park goes denser. Even a redevelopment of the Westside Pavilion would probably not include significant housing. Sepulveda has geographic issues to deal with (and the cement plant development was scaled back). Bundy had opposition to the Cadillac project and has significant single family properties south of Expo. Good points on the development issues. My issue isn’t really with development, but with the LAT editorial page, which I think in recent times takes easy stances on transit and development issues without taking the kind of more specific position that would better serve public discussion. My reaction when reading the piece was “4200 to 6000” is a significant number. The editorial suggests it’s not enough. So the obvious question: how much? where? The Pico corridor? Westwood Boulevard corridor? If the idea is to be a local news/opinion source that’s vital to readers, I don’t understand the point of taking non-specific positions. Remove parking minimums, or at least drastically reduce them. This is consistent with the re:code LA recommendations. low density residential areas to retain their form but allow four-plexes on most properties. Allow for more housing in the “hybrid industrial” zones. There is already a huge jobs/housing imbalance in this area. commercial height limits for all structures. FWIW, the CPC did adopt a few of Abundant Housing’s recommendations. As a former RTD/MTA employee and a native of Los Angeles I can answer many of the questions asked as well as offer a number of suggestions. The Pacific Electric, (Metropolitan Coach Lines, old MTA) offered service in not only Los Angeles County but also Orange County, Riverside County and San Bernardino County at one time. These counties wished to operate their own systems and that was when the RTD was created. Since the federal government provides the majority of the cost of a new bus, the MTA is required to dispose of the like number of buses. The only way to increase the fleet in fact currently is for the MTA to pay for the full cost of a bus which exceeds $300,000 per bus. Santa Monica Transit (BBB) has established routes many dating back to it’s creation and the MTA can not infringe on their territory and although they have infringed on the MTA’s and it’s predecessor agencies. This is true for most of the older municipal agencies. Foothill Transit as well as Commuter Express were created originally from former RTD bus lines. Added to that, there are numerous MTA Contractor lines like the 232. The reason the BBB and others can charge a lower fare is although they carry approximately 60% of the passengers in Los Angeles County, they receive 80% of the tax subsidies. All of these agencies have fought to stay independent of the MTA and limit transfer privileges between them and the MTA. The number system as outlined by several was instituted in June, 1981. It straightened out the lines that had been created over the years by former agencies that often followed former streetcar routes. Unfortunately since the creation of the MTA some of the lines have been created or altered that do not fit the original criteria. Buses are scheduled according to best circumstances. But said circumstances do not include detours, heavy traffic, heavy passenger loads and of course breakdowns. While Wilshire Bl. is wide enough to accommodate Bus Only Lanes most streets do not. And why it took several years to re-introduce those Bus Only Lanes on Wilshire and the millions spent to do so is beyond me. A case in point is Santa Monica Bl. Total grid lock westbound in the morning and eastbound at night. There is no room for a Bus Only Lane in either direction except between Century City and the 405 Freeway. Sunset Bl. which is a couple of blocks north of S.M. shares the same problem. This east-west corridor should be a prime candidate for light rail but instead we see the Gold Line being extended out of Los Angeles County to the Montclair Plaza paralleling the Metro Link on the same right of way for miles. You bring light to some excellent points. The extra % BBB gets definitely adds to the quality of the ride experience. And the fare is going down 15 cents this month if you use a tap card. Transferring from BBB to Metro (50 cents) is actually more convenient than from one BBB to another BBB (two fares required). BBB biggest criticisms are delays and the bus stops in the city of Santa Monica. As for westside traffic, costs aside, Metro may eventually regret not running the Purple line all the way to Santa Monica. Not everyone would go downtown on the Purple. A direct Santa Monica to Century City/BH train would take pressure off many of the east/west boulevards. Its not surprising that old forgotten utilities are underground in DTLA. It seems Los Angeles has a history of only planning ten to fifteen years ahead when anything is built. As in” “If its not operational, bury it and build over it, we’ll be fine. Think Bonaventure and the Red Car Tunnel; a very similar instance. I proper survey and a better EIR could have probably eliminated this, but then again, how? Maybe old records? I’m not too sure, but its a little disappointing that the Regional Connector has become a B (rhymes with witch) of a project for how short it is. It all sounds expensive too. @fine7760 are you sure the other transit providers outside of MTA carry 60% of all passengers in the county? seems like MTA coverage is greater,etc… why so high a percentage? There’s also a quality of ride that rail has, that buses generally don’t. Buses will lean to the right, they hit potholes and rough pavement, they stop and turn for all sorts of reasons. I’ll drive or go rail (and maybe the busways), and I’ll avoid buses if I can, just for that reason. – Buses headed downtown (especially to LAUS from west and south) hit construction and special event traffic more than ever. Why aren’t these being mitigated better? – Communicating with the service councils is very difficult. I’ve never got a comprehensive response to my bus service issues using the existing non-SC-specific email address. It doesn’t help that the South Bay SC refuses to change meeting times or location, even occasionally. Note to ‘housing shortage’ complainers, be sure to check out the giant apartment complex soon opening near Yukon and Rosecrans in Hawthorne. Next, check out the expansive 125 bus schedule …. major oops ….